Get potent and powerful - when you unleash the power of instinctual eating. 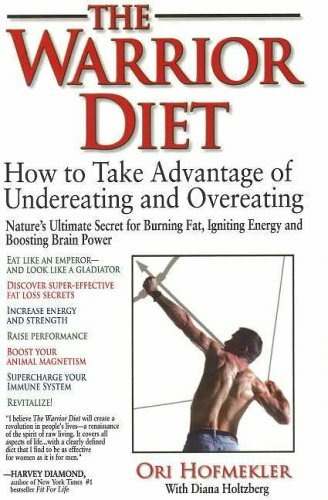 The "Warrior Diet" presents a brilliant synthesis of modern scientific research and ancient time-tested secrets for reducing body fat, gaining energy, getting stronger and looking younger. Our problem, according to Ori Hofmekler, is that we have lost touch with the natural wisdom of our instinctual drives. We have become the slaves of our own creature comforts. The result: ill-advised eating and lifestyle habits that leave us vulnerable to all manner of disease - not to mention unwanted flab, premature wrinkling and a sagging, weak, unattractive body. The first step is to break the chains of our current eating habits. The "Warrior Diet" proves that humans are at their energetic, physical, mental and passionate best when they 'undereat' during the day and 'overeat' at night. Once you master this essential eating cycle, a new life of explosive vigour, good looks and vitality will be yours for the taking. Not just a diet, but a whole way of life, "Warrior Diet" encourages us to seize back the pleasures of being alive - from the most refined to the wild and raw. The "Warrior Diet" is practical, tested, and based on common-sense. Expect results! In a world where everyone obeys the rules sometimes someone comes along to break them, sometimes they push boundaries and limits that make many people, at first sight, reject them and their claims as heracy. Ori Hofmekler does exactly that with his book the Warrior diet where he tells you how it is and how you want it to be! Overeat and get the results you want. Whether it's weight loss or more energy, Ori explains in detail how to eat to become a true warrior. By following the undereating and overeating rules you can release creative energy inside which can see your goals come true. This book isn't written just for any old person but takes into accounts the needs of athletes and busy people alike and is crammed with info, recipes and even workouts and his philosophies on romanticism and even history. 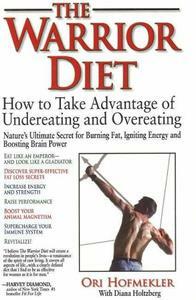 How many diet books have you read recently that tell you how to combat stubborn fat properly. Not many im sure but this book will blow you away and will really make you think again when you eat! and believe me you will eat, you'll eat more than you've probably eaten before and you'll eat well, good clean and nourishing food our bodies yearn for but have lost due to our own negligence and fast food fanaticism!